Automation is the key to business today. If you are in business, you’ll realize soon enough, that there’s always so much to do that it becomes almost impossible to manage the show. Most marketers you’ll meet feel overwhelmed. They will often work long hours, just to keep the show going. They will crank out one project after another, send email after email. The end is never in sight. The most seasoned marketer too is bound to feel scatterbrained soon enough. There’s just one way to stop this madness. You’ll have to work smarter, not harder. You must change the way you are working now. Do things that improve your efficiency. Luckily, there are ways to automate many of the processes that can help you immensely here. For instance, you could design an email template with a subject line that has worked for you before. You can then schedule to send it. Compare this with having to send the message individually to each person, and you’ll get the point. You can probably do it if you have a small database. But for a large database, you definitely need a different approach, because you will surely get overworked and overwhelmed soon otherwise. 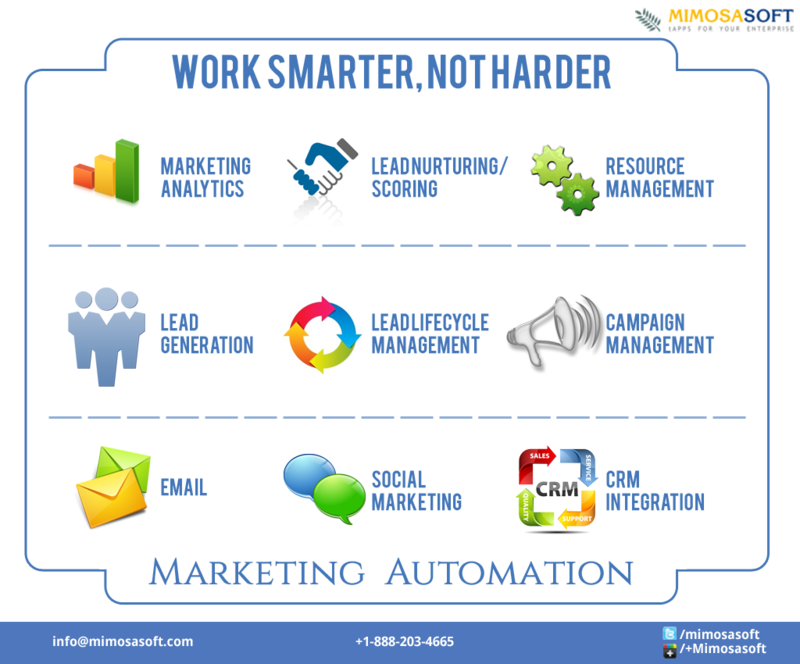 Marketing automation is the solution. With this, businesses, irrespective of their size, can re-engineer the workload to improve efficiency. It is essential to integrate marketing efforts, and cut down the manual processes so that marketers have free time for trying new things. The integration of search marketing, email, social campaigns, lead generation, analytics and CRM allows smart working, and hot hard working. Beginner level – Set up autoresponder for simple messages like welcome and thank you mails. Intermediate level – By using a lead nurturing program, you can send content to prospects based on their interests and actions. Advanced level – Use segmentation for sending targeted mails to specific groups based on geography, interests, and sales cycle stage. Decide rules to fix what messages to send and when to send them. The messages you send could be more than just emails. It could be SMS or a direct mail as well. Here are some rules you can send. Send if the last email was opened. Send on a precise date, like June 13, 2014. Send if you haven’t received the payment within the first three days of the month. Remove from contact if the score is more than 1,000. Send an alert to the sales department. Display video MA85145 if a prospect is from New York. Before doing marketing automation, marketers will often disparate web analytics and CRM. However you can get a holistic view of your activities if you integrate them with your automation solution. Plus, you’ll also get a clearer picture of that is driving people to your website, and the content that interests them. You can do this following. Beginner – View all prospect activities within the CRM, assign leads to the sales people automatically, and automate lead qualification with grading and scoring. Intermediate – Analyze the ROI of individual campaigns, and find out the channels that are getting you the maximum qualified prospects. Advanced – The automation of reports and consolidation of important metrics such as “click-through rate”, “cost per acquisition” and the “conversion rate” into a single system. These indicators are going to help you track and measure success. Integrating social media into the automation strategy frees up your time, while still letting you stay personal and responsive. Beginner – Tools like Hootsuite lets you post in many social networks from a single interface. This saves you time. You can then apply this saved time to do more. Intermediate – Schedule posts at natural time intervals. Advanced- You’ll want to alternate between real-time communications and scheduled posts to make sure that the social media is not over-automated. It’s important for the fans and followers to see the human effort as well. Automating your marketing efforts allows you to efficiently manage your many of your basic marketing goals, which frees up some of your time to work on other projects. Explore the tools around you and take advantage of any way to ensure you are able to work smarter, not harder.